That’s right! 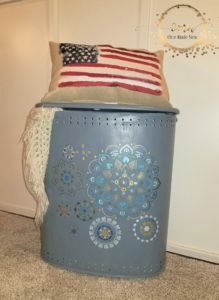 For just $3.00 in an online auction I won a vintage metal clothes hamper with all of the hinges and riveting intact! She was a little battle worn and beaten, but so am I so I figured we would make the perfect pair. Honestly, I have been looking for one of these for about two years now, so when I found this one I knew what I wanted to do. 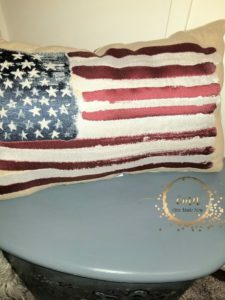 I am redoing my entire house and my room is coming up in short order on the list, so I am getting all of my furniture and finishings together. 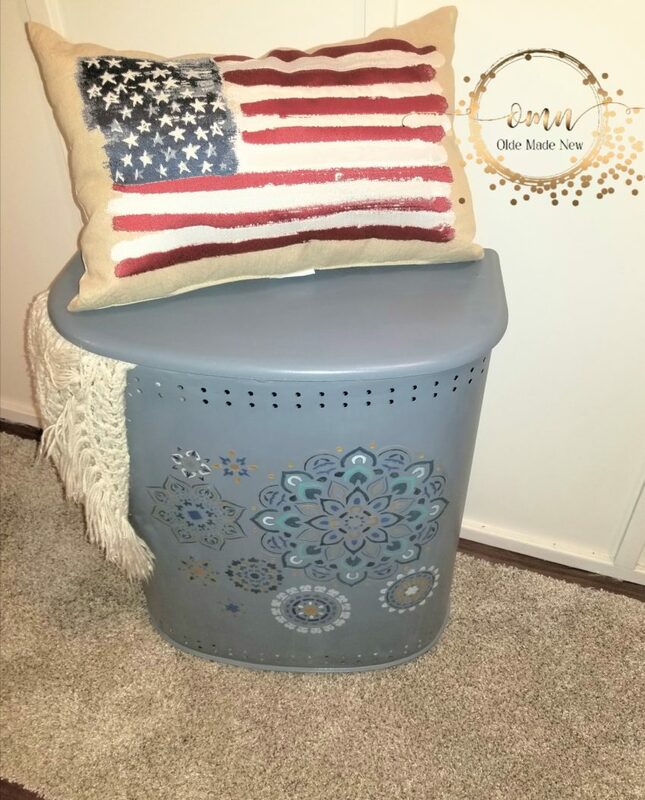 I LOVED the idea of a vintage metal clothes hamper sitting in the corner so my socks no longer litter the floor. I’m usually really good about picking up, but I wear socks to bed, and then some time in the night I kick them off and onto the floor, and it on the side of the room I never look at until I am dead tired and ready to go back to bed, so usually there are three or four pair by the time I pick them up. This post contains affiliate links. They do not effect your cost in any way, I just make a very small percentage that I use to keep bringing you makeovers, tutorials and reviews. I recently got to try Rainbow Chalk No Prep Paint and I LOVE IT! 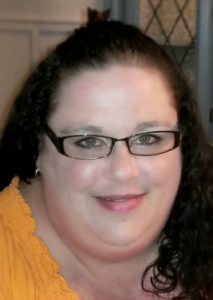 After getting started with $80.00 in products I won an additional $150.00 in products in a Bingo Giveaway!! So I got it all! 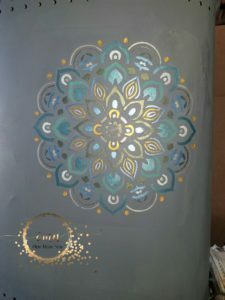 You can do the stencils in any color you want, I just wanted the shine so I used the metallics and brighter colors to give it the look I wanted, but you can use any stencil and any type of wax or paint you want to fit into your color scheme. I am doing my room bright and girly this time, which is a new departure for me. I usually stick with dark browns, beiges, and burgundy. 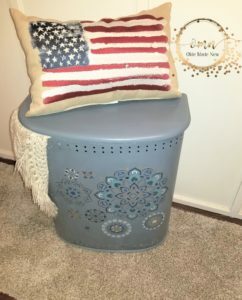 This time I am blinging it out, but I wanted this hamper to blend and stand out at the same time, I put it out to my fans on Facebook to pick the color, and they went with a much more subtle hue of blue and gray. Blue Berry by Rainbow Chalk No Prep Paint is the perfect blend of blue and gray. Dry, it looks like a faded pair of blue jeans. I just love the aesthetic of it!! 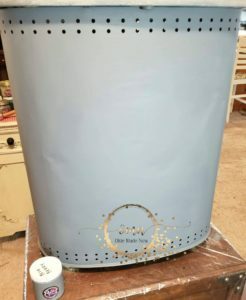 I painted the base coat on this LIVE on Facebook if you want to see the coverage, prep, and the original look of the hamper. So before you put a stencil on your piece, wax it to protect your paint from the adhesive on the tape to hold the stencils down. You usually will not have a problem with the paint coming off….but it is always better to be safe than sorry. Rainbow Chalk No Prep Paint Clear Wax is AMAZING! You just wipe it on with a rag and buff it out if you go to heavy in spots. This stuff was dry and ready for stencils in just TEN MINUTES! I will say before using this, make sure you are in a ventilated area because it does have a smell. It is still low VOC, but something in the formula makes it smell like poly would. But it doesn’t stay with the piece. When it dries, the smell goes away. I had planned to have my viewers pick the colors for the stencils and how they were placed, but that was the day of the infamous Facebook crash of 2019, so I made the choices myself. 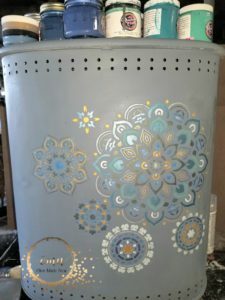 I didn’t want to overdo it with stencils so I started with the big one first and did the details in bright, vibrant metallics. Then I just clustered them around that one a bit. I love how it came it, but it took me almost 6 hours to do all of that stenciling because I wanted to be meticulous. The end result was an original creation that you will never see anywhere else. That’s why I love what I do so much. I get to put my stamp on my creations and make them all mine! The last step was to get a sealant down on my hamper so that it would be protected from scratches and knicks. I chose to go with the Rainbow Chalk No Prep Paint Gloss Top Coat. This stuff glides on so smooth ya’ll and it dries so stinkin fast it isn’t even funny! Two coats and I was done! Just a few notes. The brushes and applicators really do make all of the difference with Rainbow Chalk No Prep Paint products. The brushes are all natural bristled brushes….but they aren’t packed with bristles so they lay the paint down the way it needs to go down. Also, the top coat applicators are high density foam, which for my newbies, keeps you from getting bubbles in your top coat. If you lay a bad top coat down you are going to have to sand it back and start over and no one wants to do that. So please get the brushes and applicators when you buy your products!! I really had fun with this makeover. My business partner from All In On Business, a coaching group we launched in the beginning of March, Michelle Lopez of 4th Street Design Co. called me while Facebook was down and we had a little paint party over the phone, so I got in my groove and got busy on this one! As always, please leave any comments or questions below. I would love to know what you think and what you are working on putting your own personal stamp on! Thank you so much Annie Sprinkles!